My middle daughter is 3 next week and she has just become interested in games. We have found some that occupy her and her friend but I am always on the lookout for more. Today Red Rover arrived at our door. This is a new Pre-school game by Fisher-Price that teaches colours, shapes, numbers and letters in a fun way. My first pleasant surprise was to find that gone are the hours of removing fiddly packaging. The security tabs have been redesigned so that they are quick and easy to remove. Red Rover the dog is sturdy and compact and wears a backpack to store all the bones that form part of the game. This will make it easy to store and to put away without losing all the pieces. The game begins by placing all the bones face down around the floor. Each bone has a colour and a shape, number or letter on it. You then press Red Rover’s nose to choose easy level (colour only), or hard which includes all the attributes. Press Red Rover’s nose and he calls out a colour to find. The children run around the room turning over the bones until they find the correct one. 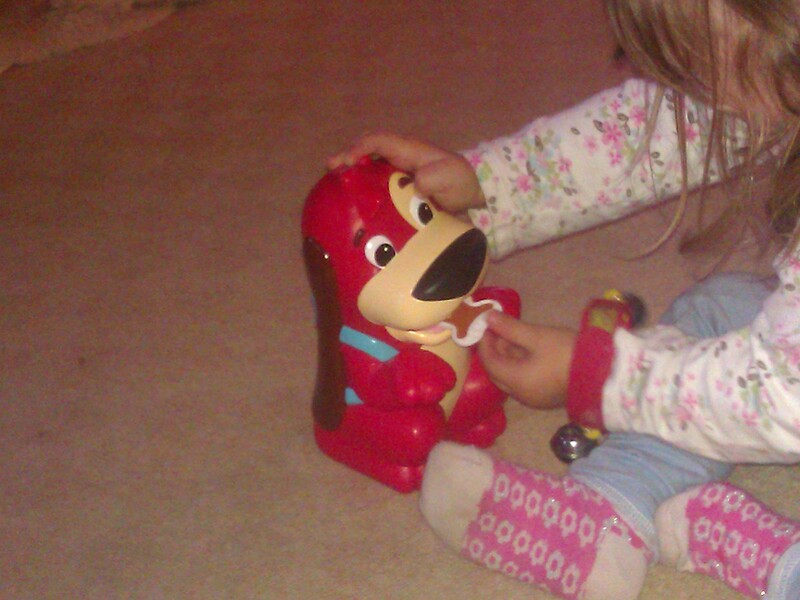 Once they have found it they put it into Red Rover’s mouth and he tells them if they are correct. If it is the wrong colour he says ‘Yeuchh’ which we thought was very cute. If they find the right one they get to keep that bone and the game continues. If the correct bone is not found within a specific time the children are directed to return to Red Rover and he chooses another. The object of the game is to collect the most bones. My kids loved it. I had to encourage my 7 year old to let her younger sister find a few bones when she got a little competitive, but they had fun together. I think I might give them a bag each next time as it was easy to forget the bones you had collected when engrossed in the fun of the game. I love that it is an active game and it kept my lively pre-schooler engrossed. I envisage a few tears as the children compete to be the first to find a bone, but they’re all valuable lessons. There were a couple of down sides. As with many electronic toys the accent is American and American phrases such as two times rather than twice are used. I would have preferred Red Rover to have had a British accent but it didn’t distract from the fun of the game. The other point is that the letters on the bones were upper case. I always teach lower case letters first and often wonder why toy manufacturers tend to use capitals. Is it to familiarise children with the initial letter of their names? My daughter is having a small 3rd birthday party next week and I will add this game to the list of party games. A great fun way to encourage children to learn shapes, colours, numbers and letters.